Two Worlds Together? 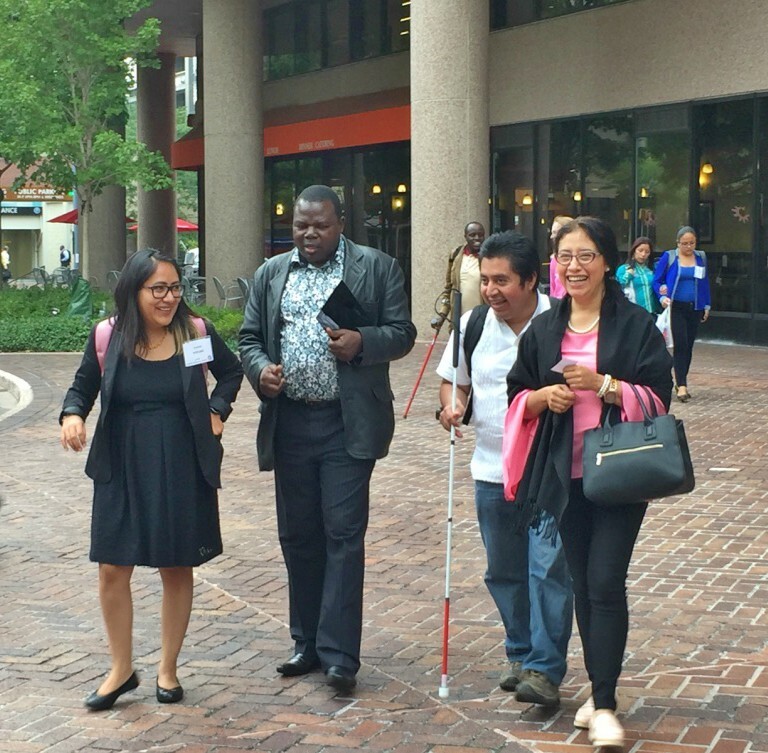 | Global Disability RightsNow! For more than eight years, I was the coordinator of a civil society organization created to promote, broadcast, and advocate for human rights on specific issues. Some of these issues are the equality and non-discrimination of highly vulnerable groups in Mexico, by doing research studies and actions for advocacy in public policies. Having this mission, the organization identified as one of its target groups the population of persons with disabilities. So in 2008, it started a first research project  which made it possible for both organizations and persons with disabilities to work together, so we focused on providing them mainly with health, education, rehabilitation, and employment preparation services. This approach, thinking only as a part of the investigation process, presented me with several big challenges. The first one was using a language that was difficult to understand for both sides. On my side, speaking about human rights issues was difficult to understand for many of people I addressed because they told me they have never used those terms I tried to explain to them, and I wrongly thought we all used the same language. On the other hand, when I listened to them speaking about disability issues, in the deepest terms of this condition, about different types of disabilities and about the different existing variables within each type, I realized that in order to reach the Project goals I had to first know every type of disability, their specifications, and to propose a newly research methodology in order to be adapted according to the specific needs of this population. A second challenge was to face the rejection, questioning, and probably zealousness of organizations and people who for decades had been working on making changes to improve the condition of services for people with disabilities, and who were probably surprised by someone of unknown origin, unaware of the cause of disability, which presented a project that invariably invaded their space--a space that so many years of work and effort had led them to gain. I was confronted daily by that which I now interpret as a defense mechanism, which manifested many times in the aggressive question: And what do you know about disability? The fact of answering many times to this question, made in many tones and with many different faces, became more and more familiar to my ears, to the point that it ceased to be a requirement in my presentations to other people. A following challenge to building confidence in the people with whom I related in the world of disability was to find a way to communicate starting from the same basic level, where the world of human rights was understood and learned, assuming that the subject of which I was researching was the subject of which people with disabilities and their organizations were [and are] object and subject, verb and complement. For this purpose, one strategy I created was to develop training workshops that would be implemented to achieve two goals. On one hand, the target group would gain knowledge and new tools to deal with disability issues from a different approach in a context where they would understand they have rights that have to be enforced. On the other hand, I would be familiar with their needs, so we could start to analyze the situation. In this way, I implemented some workshops that included at first key human rights aspects, such as the importance of the UN Convention of Rights of Persons with Disabilities (CRPD) which have recently entered into force. This workshop implementation enabled me to have a closer relation with persons with disabilities and directly know about fighting for their rights. It also gave me the opportunity to learn about any type of disability in action, which is more real and concrete by using examples than from information found in any book or document. For this reason, I consider that by making possible a communication link between both the disability and human rights worlds by implementing these workshop trainings enabled them to have enough of a confidence increase so we both could achieve the goal of working together. After doing this first research I did five more which were also published, and I coordinated to work on the first alternative report in Mexico in order to give information about the CRPD implementation process after two years of enforcement, which of course required the hard work of meeting organizations, negotiations, and dialogue with more than 100 civil human rights and disability organizations. My conclusion after participating in all these processes is that disability and human rights are not two different and separated worlds, but simply two issues that can and should complement one another to effectively achieve a major impact in the goal that they share: to live with dignity, regardless of the diversity of humanity, including people with disabilities. It was research made in order to know about the status of legislation in Mexico around the country and specially in three agencies, as a result of the implementation of the UN Convention of the Rights of Persons with Disabilities (CRPD). This research was completed after the publication called: “Legislative alignment in Mexico: updates and challenges”, IMDHD, México, 2008. Brenda Montes Betancourt has a degree of International Studies by the Universidad Nacional Autónoma de México. She has also studied Mexican Sign Language and has an education in human rights. She has cooperated in the Division of Attention of Discrimination in the Human Rights Commission of the federal District. Mrs. Montes has participated in many courses and seminars about political and human right issues, and has also cooperated in editing many documents, materials and publications of these issues, especially in research, and promoting rights of persons with disabilities. For eight years, she was the coordinator of equality and non-discrimination office of the Mexican Institute of Human Rights and Democracy A.C. She wrote more than 10 publications regarding rights of persons with disabilities. Currently, she is a freelance consultant of human rights issues.